While Alabama has dominated its opponents with the dropback passing game this season, it has stayed balanced with its run-pass option (RPO) schemes. 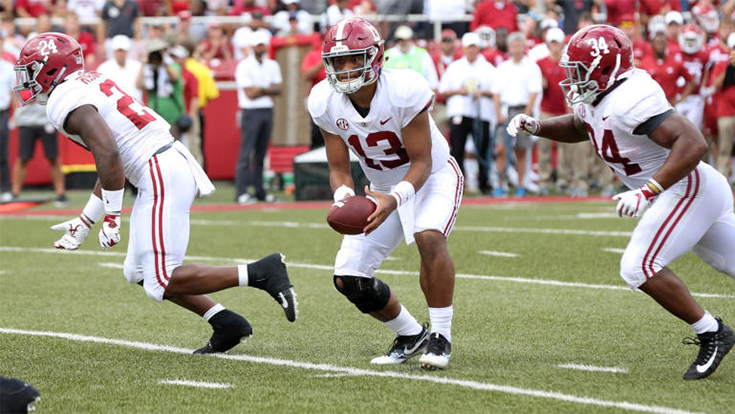 By giving Tua Tagovailoa the option to throw off most of the run schemes, the coaching staff is keeping the ball in the hands of its best player as often as possible. The Tide are predominantly a zone running team. In order to read a defender who is conflicted between run and pass responsibilities, they need to find ways to block the backside defensive end and they do this in two different ways. First, they’ll have the backside offensive lineman in the zone running scheme lock out and block back any defensive linemen, including the end. Second, they use one of their tight ends to split across the formation to the backside of the zone scheme and block that defensive end. By blocking the end, they can read a second-level defender without worrying about instant pressure on the quarterback. If the second-level defender they read dives in to stop the run, Tua can pull the ball from his running back’s gut and throw it in the vacated space. The Tide love running slants behind the linebacker they are reading. When they run the slant from the same side the running play is going to, it’s hard to stop. Many coaches teach their frontside linebackers to flow fast and hit their gaps hard while telling the backside linebackers to slow play and try to stay in passing windows for as long as possible. This type of concept counters those rules, conflicting the frontside linebackers by running slants behind them. It’s a tough play for a defense to defend. The trajectory of the ball on the throw needs to be a little different when throwing frontside rather than backside. Backside, the play creates more of a horizontal stretch on the linebacker as he flows laterally. There is a wider window to throw into. With frontside RPO, more of a vertical stretch is created on the linebacker as he flows hard downhill. The quarterback either needs to put a slight more touch to get it over the linebackers or find a window between linebackers by changing his arm angle. When the tight ends aren’t involved in blocking, Alabama has a couple of ways to utilize its strengths in the passing game. The clip below is a pop pass RPO it uses. Again, Alabama is blocking the defensive end in order to read a second-level defender. The tight end’s job is to stay just inside of the defender to his outside (if there is one). The concept works very well against zone because the tight end will be passed off. It still works against man, but there might be tighter coverage on the tight end. Without a break angle in his route, the tight end might not get separation against man-to-man coverage. The other way they use the tight end is with a slice motion. The tight end will come across the formation and bluff that he’s going to block the end before releasing into the flat. The quarterback will read the defensive end. If the end crashed inside, he’ll pull the ball and flip it out to the flat. On this particular play, they aren’t reading the end, but it shows what this looks like when everything goes right. It’s been a real interesting turn for this Alabama program that’s accepted every modern spread concept over the last few years. Now that the Tide have a great passing quarterback, they’ve been able to add a fair share of RPO’s to an already explosive offense.